Joshua Jacobs is on a mission and the mission is to introduce children to golf. For a dozen years he and his company TGA Premier Junior Golf have been doing just that with a franchise business model tailor made for PGA Professionals and others interested in growing the game. The success of TGA has led to the introduction of their own line of clubs just right for youngsters beginning the game. They didn’t create the clubs on their own but called on the background and knowledge of industry veteran Ross Kvinge of Plus One Sports who has experience with several top-of-the-line manufacturers. He is also the owner of a TGA franchise giving him additional insight into what children need and can best use. The clubs themselves are designed expressly to make them easy to hit the ball giving juniors the satisfaction of seeing results they can feel good about. The driver for example has a very large clubhead and clubface to easily make contact and yet lightweight for young swings. Irons have weight moved from the hosel, where it doesn’t help performance, to the topline of the face to make a larger sweet spot. From putter to driver TGA’s equipment uses technology that allows beginning and experienced junior golfers to excel. Boxed sets have a choice of seven color coded sizes based the child’s height with right and left handed options for both boys and girls. Parents will like the price as well. 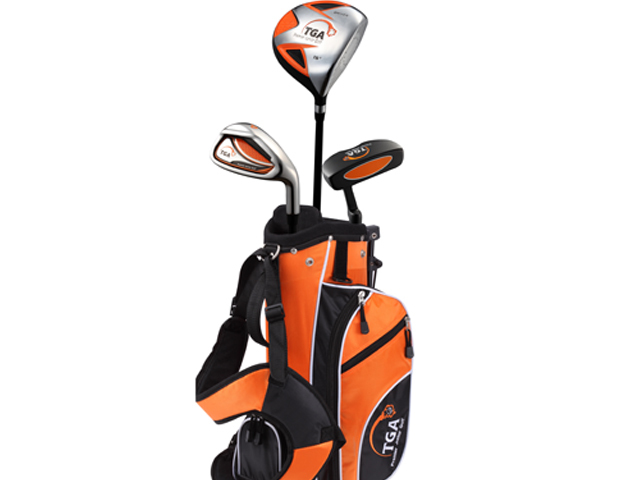 Sets of three to six clubs with a stand bag and headcovers range from $89.99 to $149.99. Also in the good news department, TGA will be offering a trade up program for families to keep their children fitted properly. Additional information may be found playTGA.com.